Sarah Good was born in Portsea (now Portsmouth) in 1826 and christened the next year at St. Mary's Church. She was the youngest of six known children of Moses Good and Elizabeth Brown to reach adulthood. Her oldest brother, Thomas, was 16 years older than her and relations with him would have been minimal as he had possibly already started his working career by the time of her birth. She was born into a fairly well-to-do family. Moses had brought the family to Portsea at the end of the Napoleonic wars, probably sometime between 1812, when the second son William was born in Plymouth, and when William and Thomas were christened in Portsea in 1815. Moses apparently did well financially during his lifetime, possibly through land purchases before the great expansion of Portsea into Landport (where Moses had property) and Southsea. We have statements from family members that Sarah was educated at home but have no other information on her upbringing. However, as we see from documents she signed she was not able to sign her name so any education must have been somewhat limited. George was born about January of 1822 in Portsmouth. He was the son of Charles Slape, a waterman, and his wife Sarah Martin. The Slapes lived at Sally Port, an area of Portsea where ships passengers obtained transport to the ships at anchor in the harbour. (A waterman was a person who rowed persons and or freight, in the harbour, as there were no piers available for ships to moor at.) George was christened on Jan 30 1822. We know nothing of George's upbringing and life prior to his marriage to Sarah Good. Thirty years pass and on March 18th, 1856 the marriage of Sarah Good and George Thomas Slape occurs in the parish church at Alverstoke, the community just across from Portsea in Portsmouth harbour. Both George and Sarah are said to be resident in Gosport, the city that grew up around Alverstoke parish. Interestingly we see that Sarah is using the name 'Eliza'. We do see that she is the daughter of Moses Good, a 'Dealer'. It is interesting to see that George signs his name but that Sarah (Eliza) merely makes an 'X' indicating she was not literate. Another interesting item is the appearance of Priscilla Good as a witness to the wedding. Priscilla was the second wife of Moses Good and only a few years older than Sarah -- they may well have been good friends. It is part of family lore that Moses disowned Sarah as a result of this marriage. It was a strange sort of 'disownment' however, as Priscilla was at the wedding as a witness and apparently Moses gave Sarah a furniture business as a wedding present. George and Sarah had several children, and when we look at the date of birth of the eldest we perhaps gain some understanding of the rift that occurred when Sarah married George; she was six months pregnant at the time of the wedding, and may already have mothered a first child, named George after his father. There may also have been some dissatisfaction with George as he was a mariner (later waterman) and this may have been considered unacceptable to Moses. Whatever the situation there seems to have been some sort of split between Sarah and Moses, according, at least to the children of Julia who was one of Sarah's daughters. The first census record we have for Sarah and George in is the 1861 census of England. The recorder has spelled the name "Sleap" rather than "Slape" but this is definitely our family. George and Sarah by this time have four children ranging in age from son George who is 8 years old to daughter Julia (my great grandmother) who is only seven months. It is interesting to note that George has apparently been born three years before George and Sarah were married in 1856. If George is Sarah's child (at this point we do not know for sure one way or the other) it might also be cause for some of the friction between Sarah and her father. Note also that Sarah has now reverted to her birth first name after using the name 'Eliza' at the time of her marriage to George. At this time George is shown as being a "Waterman" so there is no indication that at this time Sarah and he are running a furniture business. The last public hanging in London took place on May 26, 1868 when Michael Barrett was hanged for blowing up the wall of Clerkenwell Prison in an endeavour to set at liberty two Fenians (Irish republicans) detained there. There is a family story that Sarah attended this hanging. It is said that one of her brothers was a lawyer or legal clerk in London and that he arranged for her to attend on a visit that she made to him in London. We know that Sarah had two brothers who might fit this description, namely Edmund and Frederick. Edmund had a daughter Sarah Ann Good who was born in Middlesex, (outside London), however Edmund is listed as a fishmonger in the 1881 census in Portsmouth. Frederick married an Edith Fry in Portsmouth in 1850 but apparently died a year or two later. It is possible that the referenced brother was, in fact, a brother-in-law. If this is the case it would need to be the husband of her older sister Emma of whom we so far have no information after her christening in 1826, or, alternatively is a sibling that we do not yet know about. To give credence to this story there is the family annecdote that locates Moses in London in his later years, living with a son. It will be interesting to find out if there is a London legal connection. We do have evidence that Moses was living in South Norwood (that is where he died) but it appears he was then living near the daughter and son-in-law of a child by his second marriage. In any case, it is interesting to think that Sarah might have been at this hanging. FATAL BOILER EXPLOSION AT SOUTHSEA . . ."A person named George Slape, a waterman and a broker, residing at the corner of Brunswick Road, Landport, was passing at the time, and was killed on the spot by the falling debris, his brains and other portions of his body being scattered some considerable distance from the place where he was struck." "Killed . . . George Slape, 48 years of age, with a wife and seven children (the former expecting again to be come a mother) a waterman, living in Brunswick Road. Slape had, we understand, taken the precaution to insure his life with the Railway Passenger's Assurance Society . . . On examining the body of George Slape, he [the coroner] found a comminuted fracture at the whole of the back of the skull. On the right side there was a deep wound under the armpit and lower down there was a wound 12 or 13 inches long, reaching across the back to the left side. From a part of this wound the greater part of the liver and stomach was protruding and a part of the liver and kidneys had escaped altogether. Almost all the ribs on both sides were fractured. There were two flesh wounds on the left arm, and the right thigh bone was fractured, in two places. There was also a fracture of both bones of the same leg." "Charles Slape, a mariner, living at No.3 Tower St. identified the body of George Slape his brother, who was a licensed waterman. He was 48 or 49 years of age, and had a wife and seven children, with his wife now daily expecting to be confined. About four o'clock on Tuesday afternoon he parted with his brother at Southsea beach; and before he got to Point some person told him that his brother George had been killed." Tower Street showing the house that Charles Slape lived in at the time of George's death. This is one of the few streets in old Portsmouth that was not leveled during the bombing in W.W.II. A member of the Slape family lived at this address for almost all of the 19th century. Note the very narrow street which was characteristic of all of old Portsmouth in the 19th century. It is interesting to note that in the newspaper coverage of George's death he is listed as being a waterman and general dealer, while the 1861 census and the death certificate indicate only that he was a waterman. It is likely that Sarah was managing the business and that it was a second job to George. The 1871 census found Sarah still living at 2 Brunswick Road with six children, the oldest of whom, Reuben, was 16. We note that by this time, the oldest son George, is no longer living with his mother and also that Sarah is now a furniture broker. Source: Census of England 1881; FHL Film 1341278 PRO Ref RG11 Piece 1139 Folio 44 Page 3, from the LDS CD. The 1891 census finds Sarah and her youngest son William, who is single, still living at the 117 Lower Charlotte address. They are next door to her son Charles and daughter-in-law Carolina. At age 60 Sarah is still listed as a second hand dealer and William is apparently her assistant. The 1901 census shows Sarah living in an expanded household at 117-9 Spring Street. Now the two sons Reuben and Charles and their families are all in the household. Sarah by this time is 76 but is still shown as the head of the household and a general dealer shopkeeper with both of the sons as assistants to her. The family has thrived and a total of eleven of the family are living in the two homes. By 1907, when her son-in-law, Walter Scott, retired from his career as a policeman in London, she was living in the Milton Infirmary (a 'poor house') in Portsea. Walter and Julia moved back to Portsea and arranged for Sarah to move in with them. This arrangement only lasted about a year or two. There was a clash of personalities between Julia and her mother with the mother declaring on more than one occasion that she would rather live with her friends in the poor house. The Scott's knew the man who ran the Infirmary and so arranged for her to return there. This was effected by having a cab come by after dark to take her so that the neighbours would not know . . .
Sarah died at the Infirmary in 1918. She is buried in an unmarked grave near her son Reuben in Kingston Road Cemetery in Portsmouth. obtain a copy of the death certificate for Sarah Good. Derek Slape for information on Sarah's life and for guided tours of Portsea to see places the family had lived. Derek provided the newspaper extracts of George's death. Iris (Simmons) Groutage and her daughter Jennifer (Groutage) Hart for information and anecdotes Sarah Good. Doreen (Beer) Scott and her son Andrew Scott for a tape of Kitty (Scott) Barnes recounting some information about Sarah Good. 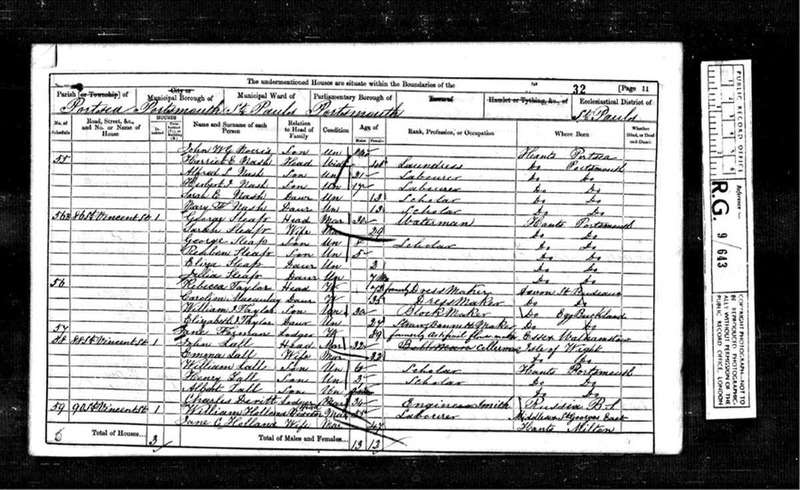 Richard Child for images of the 1861, 1871, 1881, 1891 and 1901 census.